We look forward to seeing you at this event in 2017. The ride starts from the world famous Sydney Taronga Zoo gates at 5.30am (roll out time) where the ride groups make their way from Mosman to Yarramundi Lookout where all riders regroup around 10.00am for a 15min rest stop (79km covered). From there the riders make their way to Springwood where the groups will stop for an early lunch at 11.30am. Here we will get updates on any road conditions ahead. After the lunch stop at Springwood the groups get back on the bikes and embark on Stage 2 of day 1. Departing Springwood around 12.30pm riders make their way to Wentworth Falls where riders can again top up for fluids and food (around 2.00pm and 117km covered). The groups then start the ascent to Katoomba. This brings to an end of Day 1 and a total distance of 124km covered for the day. Riders make their way to Echoes Hotel for "First Beer in Gear", before heading to their accommodation for a well earned shower then adjourn to a restaurant in Katoomba for dinner. Riders’ farewell the beautiful township of Katoomba and tackle the 17km ride to Mount Victoria. We will stop for a coffee and regroup before enjoying 28km of rolling hills and a twisting descent into Lithgow where another coffee shop will be found and riders can shed their cool morning kit (weather permitting of course) in readiness for the 62km ride to mecca of the V8 Supercar world, Bathurst (107km covered so far). The groups get a chance to refuel, stretch and take a relaxing break before hitting the long black line again for the 58km journey into Orange (164km covered). This brings to an end of Day 2 and a total distance of 164km covered for the day. 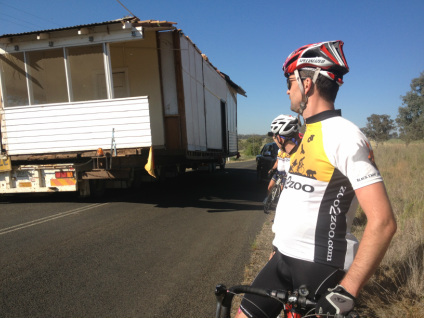 Riders make their way to the Hotel Canobolas for "First Beer in Gear", before heading to their accommodation for a well earned shower. The stay in Orange is fantastic on this Zoo2Zoo ride as all the riders gather at the Hotel Canobolas for a great country dinner, and time to sit, relax and discuss the many hills they have conquered on the past two days. Highlights of the evening are a presentation and chat with a representative from the Black Dog Institute (BDI) who gives an amazing insight into the work this great institute does, and how the money we all raise benefits those effected by mood disorders, and the ‘Kangaroo Court’ where riders and support crew get to have some fun and hand out jovial $2 fines (e.g. the most of number of punctures for a rider or group, brightest Knicks, shoes etc). We say goodbye to the lovely town of Orange with a 6am departure after a breakfast of cereal and juice and embark on a fantastic 33km ride into the picturesque country side known as Molong. We then embark on a 23km ride along the rolling hills into Cumnock for bacon and egg rolls. On a good day you can smell the bacon and eggs being BBQ’d a few kilometers just outside Cumnock. This enticing scent has seen some individuals within a group launch an attack (like a breakaway in the final kms of a stage of the Tour de France) on the run into Cumnock, so they can claim line honors in the breakfast cue. The next 25km stretch sees the groups riding to Morris Park, which is the final regrouping point. At this point all the groups come together as one peleton for the 5km roll into the Taronga Western Plain Zoo, where family, friends and the local community cheer all the riders for their great achievement. The cost to enter the Sydney to Katoomba to Dubbo Zoo2Zoo is $500. Event entry includes accommodation on the Friday evening in Katoomba (shared accommodation) and Saturday evening in Orange (shared accommodation). See our Zoo2Zoo Accommodation Policy for further details. - breakfast, morning tea and lunch on the Saturday.